Use discount categories to automatically discount products and services. Do you offer some customers discounted pricing, or want to incentivize people to order certain products in bulk? Apply discount categories to your organizations in order to provide automatic discounts on opportunities. Head to System Setup > Discount categories to add and manage discount categories. It's under the Static Data heading. To create, click the green add a discount category button. First, enter a name for your discount category. 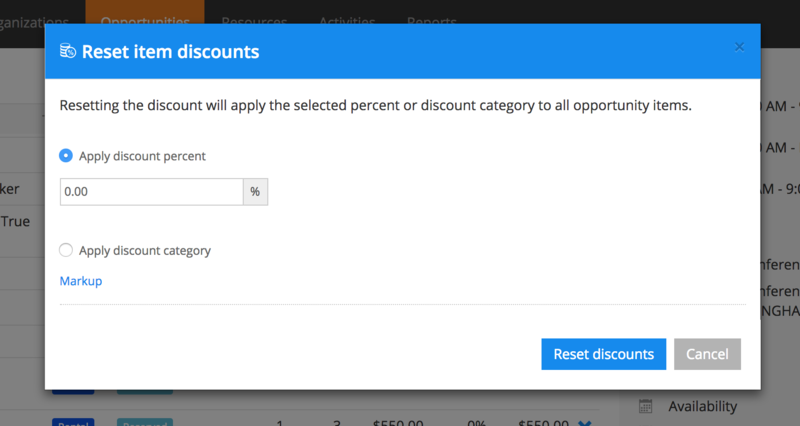 You'll see this in the drop-down box when selecting a discount category in People & Organizations. Use the “Active” toggle to turn this category on or off – it it’s set to NO, it won’t be applied. Each discount category is made up of a set of discount rules that determine how much discount to apply and which products and services that discount should apply to. Current runs through each of your rules in order and applies the rule that matches first. Use the blue arrows to re-order rules. Rules are matched if ALL criteria apply. This means if you specify a tag and a product group, the rule is applied when both of those criteria match rather than when either of them do. Specify how much discount should be automatically applied. When should the discount category be applied? Leave these blank to apply for all time. If you are entering a valid from or valid to date here, keep in mind that you need to fill out both fields. Use the quantity from and quantity to fields to discount particular quantities of items – great for offering discounts on bulk rentals or purchases. Leave these blank to apply for any quantity. If you enter a quantity from or quantity to, you must fill in the other field. 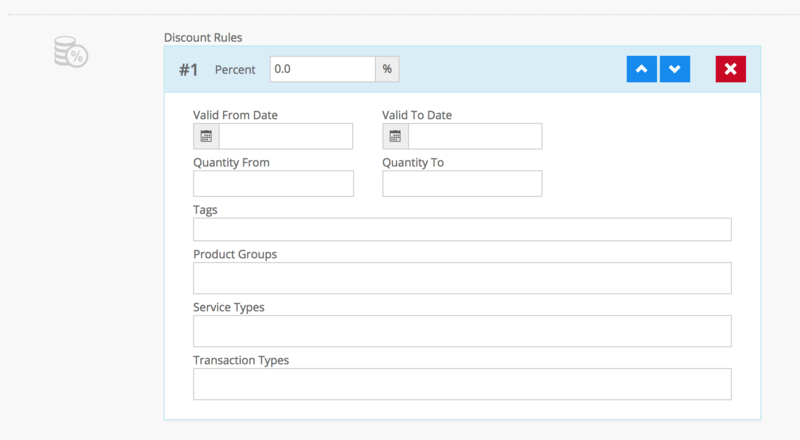 Choose tags to apply this rule only to products and services that have certain tags. Leave blank to ignore tags. Choose product groups that the rule should apply to. Leave blank to apply to all product groups. Choose service types that the rule should apply to. Leave blank to apply to all service types. Choose the transaction types that the rule should match: rental, sale, service, sub-rent, or sub-contract. Set discount categories to your organizations by editing an organization in People & Organizations and choosing the category from the list. No need to turn anything on or change opportunity settings; once you've set up your discount categories, they're automatically applied when you add items to an opportunity or invoice with an organization that has a discount category set. When creating an opportunity or invoice item or using the add new item screen, Current will search for a matching discount rule as you enter information and update the discount field for you. Products added using the picker are discounted where a rule matches. When you edit an opportunity or invoice item, if you make changes that means that a rule applies then the discount field will update for you. Changing the quantity inline in the items list will also automatically update if a discount rule is matched. Current will let you know when discounts have been applied or changed with a notification at the top-right. To override a discount that's been applied, click on the discount in the opportunity items list or edit the opportunity or invoice item as normal. The system will record that it's been overridden. When you make changes to the opportunity or invoice or the items, the discount category will not be applied and Current will let you know with a notification at the top-right. If you change the discount back so that it matches the discount category, it's no longer considered overridden and will be updated along with the discount category. Use Reset item discounts under Actions to specify that items should be discounted according to your discount categories. Use the blue arrow next to a discount category in System Setup > Discount categories to delete or edit a discount category. If you’ve already created categories, you can clone an existing one by using the blue arrow next to the category in the list and choosing Clone from the menu.